What my husband brings home in his lunch cooler when we can’t figure out what else to have for supper. You’ll be living it soon! that’s just NOT RIGHT! we have frozen pizza when we don’t know what else to have! We have lobster when we run out of frozen pizza! Can’t wait! June is coming fast! They’re cheap! That’s the problem! Their cheapness also makes them the ideal default dinner. Sure beats hot dogs. But you guys are getting a bum deal. Bruce talked to Henry in Nova Scotia tonight. They have been getting $3.50 all week! This does not look good. Who is making the money? Certainly not the lobstermen. Those are lobsters?! That makes a lot more sense. I thought they were like overgrown cockroaches or something. Ha ha Laura! My husband is a lobster fisherman. Right now the boat price is $3.75 /lb. With the cost of bait and fuel, that makes lobsters cheaper than hamburger for us. Could be worse, but local fishermen are grumbling. Did anyone in your family ever own a lobster boat named the Betty Lou? That was the one we used to go out on. That was about 50 years ago! 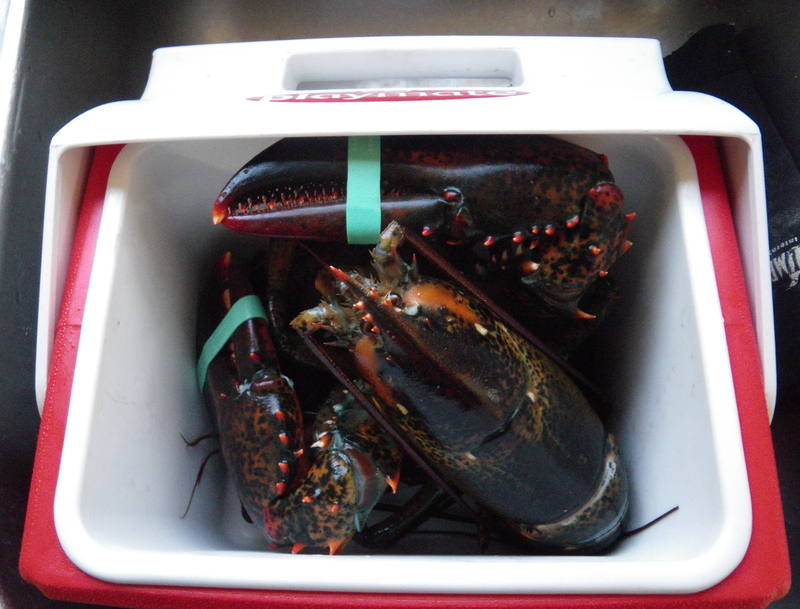 I just LOVED going out and seeing the lobsters and all the interesting catch. I also remember the strong smell of bait. I am so glad I have this as one of my experiences in life. I love lobsters but this makes me appreciate them all the more, especially since this can be a dangerous profession. Anita, the Betty Lou belonged to Roland Sprague. His boat was wrecked in a storm in 1959, and he and his crew Freddy Fernald did not survive. His wife Betty Lou stayed on the island to raise her daughters Joy and Juanita. Betty passed away last year, but her daughter Joy still lives here and has been our postmaster for years. Islesford is still a beautiful place, but you would see many changes since 50 years ago! More of the roads are paved and there are too many cars. But we are still only accessible by passenger ferry. Lobstering has changed quite a bit since then too. No more wooden traps. They are all wire. If you haven’t read it, you might enjoy the book, “The Secret Life of Lobsters” by Trevor Corson. Trevor was a sternman for my husband for two years. He wrote the book about the natural science of lobsters, but he parallels his research with stories of the Islesford community and some of its fishermen.